Homeowners, property managers and business owners are seeking safe, effective, nontoxic tools to manage tall grass, woody shrubs, invasive plants and annoying weeds. 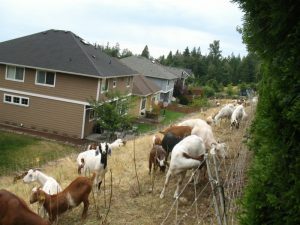 Healing Hooves goat rental services for vegetation control in Washington and northern Oregon can help you manage the most stubborn non-native plants such as blackberries and English Ivy. One treatment with goats will not eliminate your weeds, but goats are a great initial treatment. Their active grazing will open up a stand of blackberries and reduce English Ivy to ground cover, easing long-term weed management. Renting goats is also a great way to “mow’ difficult sites to prevent blackberries and other weedy plants like thistles from taking over. Healing Hooves’ goats are experienced, disease-free and, most importantly, they are ready to graze! Why does experience matter? Just like humans, goats have learned food preferences. You may think all goats are the same, but they are not. Rental goats from Healing Hooves have a wide range of experience eating a broad diversity of weeds, and are excellent foragers. They are acclimated to the sounds of urban areas and are not stressed by urban noises such as emergency sirens and low flying planes. That experience translates into goats ready to focus on eating your weeds. Agile goats easily deal with steep inclines and obstacles. Healing Hooves goat rental services bring animals to your location to chew on poison ivy, thistles and many other weeds. Determined goats will stand on their hind legs to reach the tops of “old growth” blackberries and abundant English Ivy choking trees. Mature goats can reach five to six feet above the ground or above if there is something to climb on! 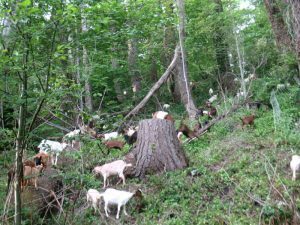 Goats are a great tool uncovering those hidden items that can be a hazard for brush removal equipment, like boulders, downed trees or human debris. Goats will strip the leaves and small branches off blackberry canes. They cannot eat the mature, woody blackberry canes but their healing hooves can flatten tall thickets into a manageable project for taking the next step in restoration. Renting goats can significantly reduce the work necessary to remove blackberries and ivy and eliminate the use of herbicides. It is important to keep in mind that additional work is necessary after the goat treatment to replace the undesired plants with desired plants. Goats can be used to significantly reduce blackberries on a site. For that level of impact, the goat treatment needs to be repeated two times per year over a period of 2 to 3 years. How much area the goats can cover in a day varies with the type and density of the vegetation. On average, Healing Hooves’ herd of over 200 goats can treat an acre of blackberries in two to four days. Goat rental is priced by the day. Goat rental adds another tool to your toolbox to help you manage the vegetation on your property. Goats can be used to replace or significantly reduce the amount of herbicide necessary to manage vegetation. And on those sites where it is difficult to use equipment such steep slopes or soft soils, renting goats can be great way to reduce hours of back-breaking work. 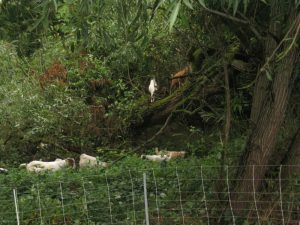 Goats are well suited to work that’s risky for a human crew using hand tools on steep slopes or around plants such as poison ivy. On sites where blackberry canes may be covering unknown hazards such as old fencing, renting goats is great way to uncover these hazards making it easier to use equipment in the future. When you use goat rental for vegetation management at your Washington property, you reduce risks by using a naturally safe way to manage vegetation. Backed by years of experience in range management and work with grazing animals, the experts at Healing Hooves have the knowledge, experience and – most importantly – experienced goats to help you manage your vegetation naturally and effectively. Learn more about goat rentals for vegetation in Washington and northern Oregon today by calling Healing Hooves at 509-990-7132.